As you pass under the I95 bridge, the river opens up to wide expanse with some shallows to port and the deep channel to starboard which runs along the marshland islands of Calves, Goose, and Nott. There are relatively deep channels that run inside each of these islands and you can make out boats moored in their lee. 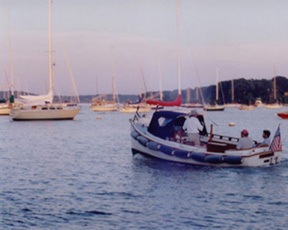 Old Lyme Marina is nestled in the sheltered cove behind Calves Island, and the mooring field extends up into the spur. Wide channel running between the anchorage and the waterfront lets you take a spin around the sights before settling into Essex. You can see past the islands to the mainland in places, where lovely homes infrequently dot the landscape. I imagine myself living in one of those and watching the waterfowl in my front yard and distancing myself from the traffic on the river. Essex sits in a bend on the river so you can’t really miss it. The latitude of Essex is 41.351N. The longitude is -72.416W. After you pass under the I95 bridge, continue up river until it bends to the right. If you go straight, you’ll be in the mooring field. Essex Yacht Club is to the left, Essex Corinthian Yacht Club to the right. 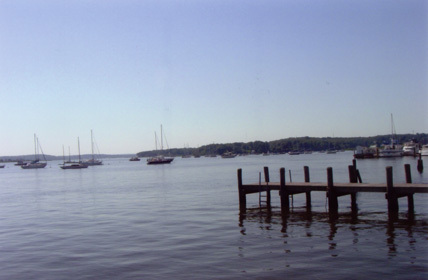 The Chandlery at Essex is located between the two prestigious yacht clubs and the Steamboat Dock. The marina is home to three centuries of shipbuilding and marine tradition, and can accommodate 43 vessels with a maximum LOA of 125'. Essex Island Marina is to the right (farther upriver), but it can be disorienting because you can see into South and North Coves. If you follow the private aids to navigation, you can do a complete drive by of all the facilities through a clear channel that runs parallel to the shore. Keep in mind that there is a swift current running through there and we had a bit of a challenge docking in a cross current. We have also anchored on Essex Shoal with easy dinghy access into town, taken a slip at Essex Yacht Club and a mooring at the Chandlery, which presented the ideal locations for some sightseeing and some real Yankee hospitality. Both EYC and the Chandlery offer launch service to the mooring field. Essex looks like a village out of the 17th century, which it happens to be. It has not really changed much. There are no global chain boutiques. It has not been developed. One thing it has plenty of is true unpretentious charm. It has cobblestone streets, an ice cream parlor, a nice restaurant or two, a place for take out breakfast, a museum, and a steam train. Norm Crampton, author of The 100 Best Small Towns in America, ranked Essex , CT #1 of all small towns in this great country a few years ago. When you walk into Essex , it’s like entering through a secret door to another century. 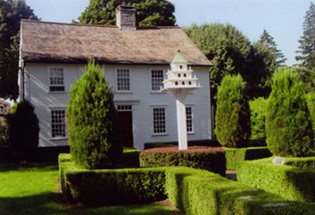 The Essex Historical Society and the Connecticut River Museum have created a 46 stop annotated walking tour of the little hamlet of Essex . The whole walk is 1.5 miles, which makes for a perfect leisurely stroll. (See below for a terrific historical walking map). 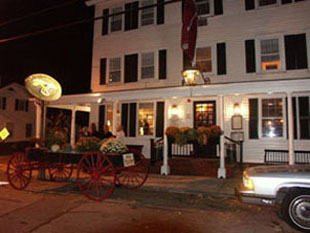 Left: The favorite of centuries, The Griswold Inn. The Chandlery has a commitment to services for the visiting boater. Their launch runs late into the night  a real benefit for our mooring customers. The year-round Chandlery Store offers everything the cruising boater needs. Every kind of repair and maintenance service is available nearby, including sailmakers, rig specialists, mechanics, electricians and machine shops. Continuing on past the steamboat landing, Essex Island Marina began simply as a boat yard and a few slips. As time went on, more docks were added, the swimming pool was installed, and the Deck and the gamerooms were built. Most recently, the addition of the Guest Services office and the Eagle's Roost communication center have completed the repertoire. We had a pleasant dinner with friends at the popular Griswold Inn, serving country fare since 1776. More than a country hotel, an extraordinary meal, or a superb drink, the 'Gris' is what Essex is all about. Warm your spirits up at its pot belly stove or a crackling log in one of its many fireplaces. Cool your thirst in one of the “most handsome barrooms in America ”. Enjoy dinner in one of the nostalgic dining rooms: The 'Covered Bridge', the 'Steamboat', the 'Library', and the 'Gun Room'. View the Currier-and-Ives steamboat prints, the library of firearms dating from the 15th century, and the historic collection of Antonio Jacobsen marine art. Friendly service topped it off. We knew we were in a delightfully small New England town. 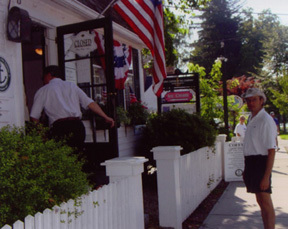 Further up Main Street is the Black Seal restaurant offering seafood specialties. The Crow’s Nest Gourmet is near Brewers Dauntless Marina at the end of Bushnell Street . They offer waterfront breakfast and lunch. The Connecticut River Museum occupies the old warehouse at the steamboat dock. The main street leads right down to the town dock where the riverboats used to dock and where the museum now resides. Breakfast consisted of pastries and drinks from Olive Oyl's Gourmet Shop while sitting on the benches at the riverfront waiting for the museum to open. The museum is really interesting. It is not typical of maritime museums as a good portion of the exhibits are dedicated to Mark Twain, one of the most colorful characters of these environs. 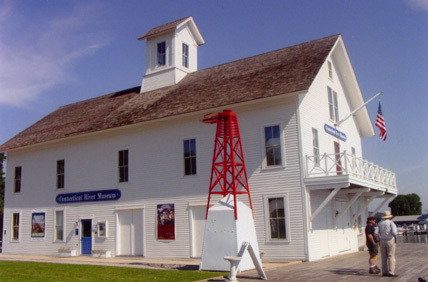 Housed in an 1878 warehouse at the old Essex Steamboat Dock, the Museum preserves and interprets the history of the Connecticut River Valley and its people, with emphasis on the lower Valley's maritime heritage. Permanent displays include ship models, a full-size reproduction of the world's first submarine, the American Turtle, navigational instruments and shipbuilding tools, Valley industry and agriculture, and small water craft used on the River. Also on the site, in an 1813 Federal-style chandler, is the Thomas A. Stevens Library, a non-circulating research facility for the study of Valley and maritime history. 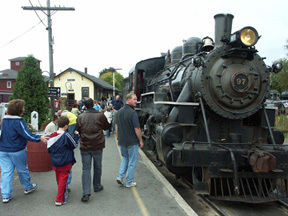 The Museum is open year round Tuesday-Sunday from 10 a.m. to 5 p.m.
You can also take the classic Essex Steam Train for a 30-minute ride through the Connecticut River Valley. It’s about a one mile walk to the train depot in Essex or call a cab ( 860-767-7433) The train limits the number of people who make this trip to 20 at a time so please reserve on the form in advance to ensure a place. Two coal-fired locomotives pull a collection of nicely restored railroad cars. Detrain at the ferry road flagstop and hike a short distance to the Chester/Hadlyme Ferry. Cross the river on the ferry and then hike up the hill to the newly renovated Gillette Castle State Park – 184 acres on a bluff overlooking the Connecticut River. Early 20thC director/actor/playwright William Gillette, famous for his portrayal of Sherlock Holmes, built this castle-like mansion modeled after a German fortress on the Rhine. Inside the 9 bedrooms, 7 baths and public rooms are filled with hand carved fixtures and creative touches. The grounds are equally unique and trails follow the former 3-mile narrow-gauge railway bed. The total walk (to the park) is about 3/8 mile each way (3/4 mile round trip). The total train/ferry/walk is about one hour going and about 1:20 returning. There are two train possibilities each day if you’re going to Gillette Castle: 11:00 am (return train at 2:24) or 12:30 pm. (return train 3:55). Yacht Clubs Essex Yacht Club, Essex Corinthian Yacht Club both offer priviledges to members of reciprocal clubs. Pump-out boat, if running, is on Channel 68; otherwise the Chandlery. 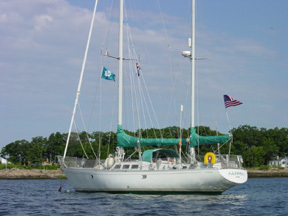 Ships’ Stores Chandlery at Essex (860-767-8267) has a ships' store. Basics are available at Essex Island Marina. The IGA (860-767-9029), the nearest supermarket, is about 2 miles away. Ferries: Essex Island Marina’s ferry crosses the 100 ft. or so of water between Essex Island the mainland on demand in season. To download a pdf of the Essex brochure, click here.